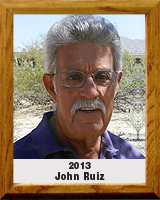 John was born in Sonora, Arizona, a copper mining community until 1965, when the town was destroyed by the Kennecott Copper Corporation, Ray Mines division, to improve and develop its open pit operations. He attended Ray Arizona High School from 1945 to 1949. He was a four-year letterman in both basketball and baseball. From 1951 to 1953 he served his country honorably as a member of the Army Signal Corps during the Korean War. He moved to Tucson, with his wife Gloria, and got his B.S. degree in Education from the University of Arizona in 1959 and his Masters in Education in 1965. He started his coaching career at Canyon Del Oro High School in Tucson in 1964. Reflective of his natural inclination for coaching, from the very start of his coaching tenure, his name mystically transformed from John to “Coach” even to students who never played for him. As an assistant football coach, he enjoyed two consecutive State football championships in 1976 and 1977. Starting in 1968, over a span of 23 years, Coach Ruiz led CDO to 13 South Division golf titles and six state golf Championships. His golf teams compiled a .774 winning percentage with a record of 721-210-11. In 1988, he was awarded the Region 8 National High School Golf Coach of the Year Award from the National High School Athletic Coaches Association. When asked to summarize his career, “Coach” stated: “Coaching sports, as well as being an educator, has provided me with the opportunity to teach young people the values of honesty, hard work, commitment, team work , selflessness, setting goals, winning graciously and losing honorably.” He is often amazed at how richly his life has been blessed through teaching, coaching and his family.